On 3 April 2017, two regulations were published in the Journal of Laws which set out the financial parameters of auctions for renewable energy sources (RES) that will be held in 2017. The government is planning to spend more than PLN 27 billion (approximately €6.5 billion) on support for producers in auctions, which will generate more than 55 TWh of electricity during 15 years. The parameters of the auctions are set out below. In 2017, fourteen auctions will be organized, each of them dedicated to different groups of installations. Nearly 75 percent of the funds (PLN 20 billion) will be allocated to new installations. 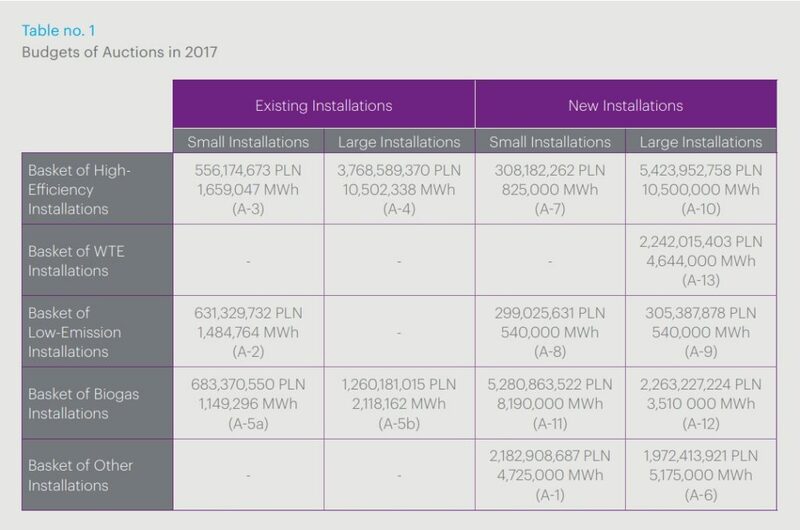 Nearly 63 percent of all funds (PLN 17 billion) will be allocated to large installations. So-called stable installations will be the most favored group of installations. The largest part of the funds is allocated to a basket of high-efficiency installations (37 percent of funds in 4 auctions). Biomass installations are expected to be a dominant group in this basket. Significant funds (35 percent in 4 auctions) will be allocated to agricultural biogas installations. It is planned to allocate funds to Waste-to-Energy projects, which should assure the construction of installations with nearly 150 MW of total capacity (one auction dedicated for new, large installations). Part of the funds will be allocated to a basket dedicated to hydro-electric plants, both existing and new (three auctions). Another part of the budget is allocated to a basket for new installations covering “other installations” (15 percent of funds in two auctions). In this basket, two auctions are planned: the first for small installations that, according to the government’s intention, will result in the construction of 300 MW new photovoltaic projects, and the second for large installations, where support could be obtained by nearly 150 MW new wind projects. Significant competition is expected in these two auctions. Installations participating in an auction cannot apply for higher support than the “reference price,” which is determined for each year. 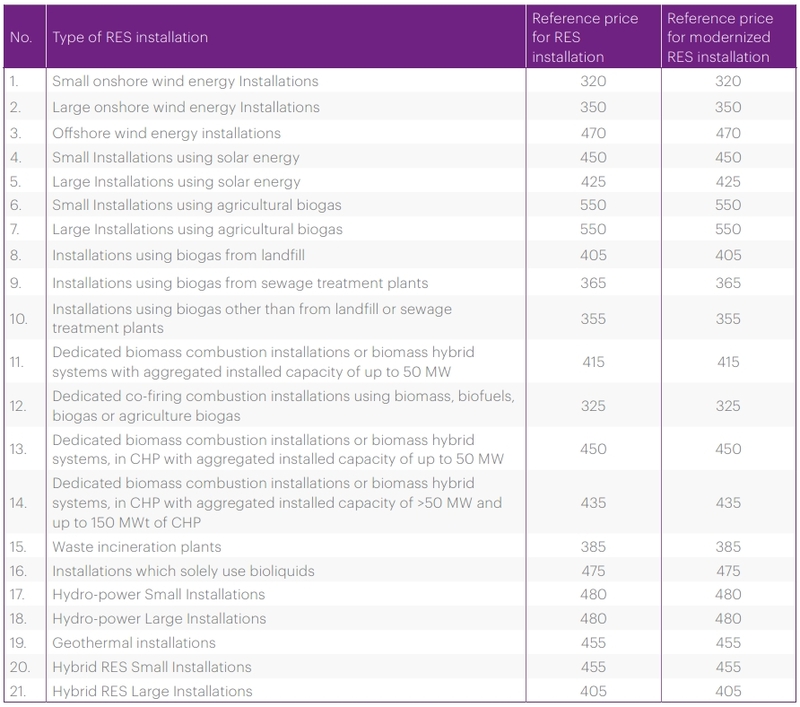 The reference price is set separately for 21 categories of installations. In 2017 for example, this price will be PLN 350 per MWh for large installations using wind and PLN 450 per MWh for small installations using solar energy. Auctions will be announced by the President of ERO and cannot be organized earlier than 30 days after its announcement. In light of the RES Act, an auction could be organized at the earliest on 24 May 2017, but no announcements regarding auctions have been made to date. Under the Act of 20 February 2015 on renewable energy sources (RES Act), there are two support schemes for RES installations in Poland. Existing installations can obtain support in the form of certificates of origin (green certificates) and can sell electricity to designated entities at the officially determined price (system of certificates). New installations will compete for support allocated in auctions (auction system) organized by the President of the Energy Regulatory Office (ERO). The auction system is dedicated mainly to new installations, but existing installations can also transfer to this system (in such case they lose a right to participate in the system of certificates). This system is intended to assure the future development of RES but in a controlled and predictable manner—this may be pursued through the allocation of budgets to auctions where installations favored by the government start and through the reduction of budgets for auctions for unwanted installations. The increase in RES in Poland, and the contemplated impact of auctions in 2017 on the installed capacity of RES, is presented in Figure no 1. Source: data from President of the ERO. The data concerning the capacity from the auction in 2017 presents only the estimation of the Ministry of Energy. In each of those baskets, separate auctions are organized for existing installations and new installations. Moreover, separate auctions are organized for small installations and large installations. Separate auctions will be organized for so-called upgraded installations, but no budget has been provided in 2017. (as it was in 2016). Therefore, in each year and in each basket, up to four auctions are possible and in total up to 20 auctions may be organized, each of them dedicated to different groups of installations (40 auctions including upgraded installations). 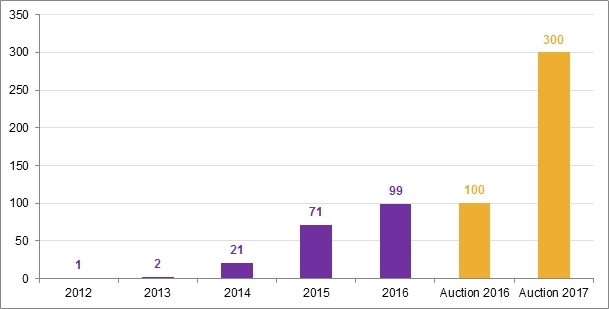 Conclusions from the above data: In 2017, the auctions will be dedicated mainly to new installations—75 percent of funds are allocated to these installations. The most supported technologies are stable installations, i.e. with predictable generation, mainly from the basket for high-efficiency installations (37 percent of all funds) and from the basket for biogas installations (35 percent of all funds). Large installations will be dominant, as 63 percent of all funds have been allocated to these installations. 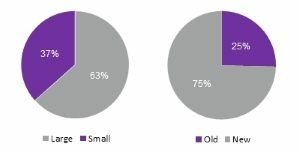 A breakdown of funds between large vs. small and existing vs. new installations is presented in Figure no 2. Source: Regulation of the Council of Ministers regarding the maximum volume and value of electric energy generated in renewable energy source installations which may be sold by auction in 2016. A more detailed description of each of the auctions is provided in point 8 below. An RES installation producer cannot submit at auction a bid that is higher than the maximum ‘reference price’ per MWh. 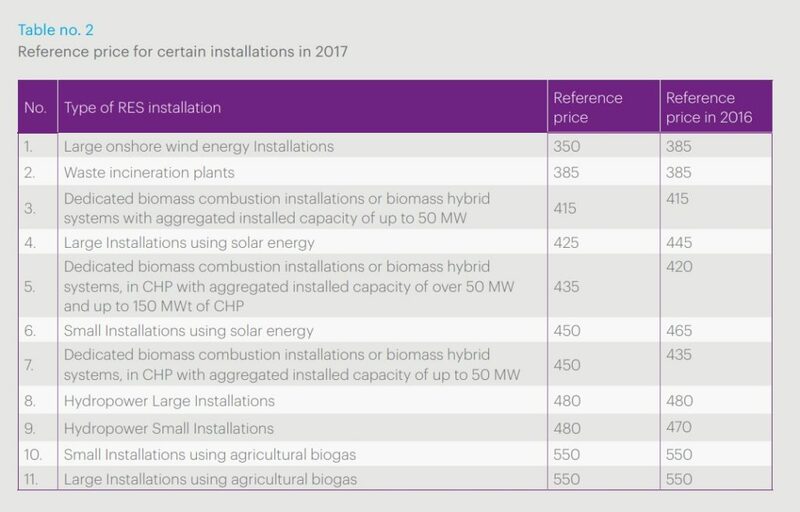 The reference price is determined for each year, separately for each of the 21 categories (42 if we take into account the additional 21 categories for upgraded installations). This division does not coincide with the division into technological baskets. The reference price is uniform for existing and new installations. Parts of the reference prices are determined separately for small and large installations, while others are the same for both categories. Below, we present the reference prices for the installations that are intended to be supported by the government in 2017. A summary of all reference prices is set out in Appendix 1 below. Under the RES Act, auctions are announced and organized by the President of the ERO. The announcement should be published in the Public Information Bulletin of ERO at least 30 days before the day of the auction starting. The auction cannot be conducted earlier than 60 days after publication of the reference prices. The regulation determining reference prices in 2017 entered into force on 25 March 2017, therefore this year’s auction can be conducted at the earliest on 24 May 2017 (if the President of the ERO publishes the announcement on 24 April 2017 at the latest). Nevertheless, some media say that the main auctions will be organized in the second half of the year. The producer that won the auction will receive support dependent on the capacity of the installation. Producers that have an installation with installed capacity of <500 kW will be entitled to sell their total electricity offered in the auction at the price established at auction to the designated entity (pay-as-bid mechanism). Producers that have an installation with installed capacity of >500 kW will have the right to cover the difference between the market price and the price established at auction in the scope of the volume offered in the auction (termed “return of negative balance”) with the obligation to return the surplus if the market price exceeds the auction price (contract-of-difference mechanism). The support is also not allocated, when the power exchange prices of electricity are lower than zero PLN (with some additional conditions). The support period for new installations is determined annually together with reference prices. In 2017 it is 15 years. The support period for existing installations is also 15 years, but it is calculated from the date the first electricity is generated and fed to the grid, as confirmed by the issued green certificate. If, after winning the auction, at least 85 percent of the quantity of electricity declared in the bid is not generated, a fine will be imposed calculated on the basis of the not delivered volume of electricity and a half of the auctioned bid price. In the case of installations with an assumed efficiency of 3504 MWh/ MW/year, a failure to reach declared capacity utilization leads to the obligation to return all public aid obtained through auctions. Below, we present a short description of each basket, stating the types of installation supported in accordance with the government’s intention. Whenever the amount is given together with the name of a specific installation, it means the reference price for this installation. The grading of individual installations into baskets is given for illustration purposes only; we cannot guarantee that in fact the indicated types of installation will start in any given auction. Four auctions will be organized in this basket, but the funds for small installations (both existing and new) constitute only 9 percent; the funds for large installations dominate. Potentially this basket may be joined by investors who plan to develop on-shore wind farms (350 PLN) installing new generation turbines. Some claim that in certain technical configurations it would be possible to achieve efficiency at the level required for this basket. The government’s intention is a transfer of nearly 50 percent of existing installations combusting biomass (probably the DBCI, although this intention is not clearly stated), but taking into account the reference price it may turn out that the auction winner will be an installation co-firing biomass with coal (DCCI). Competition in this basket is expected, as due to the declining prices of green certificates, a transfer to the auction system may be financially profitable for existing installations. In the scope of large, new installations, the government is planning to award funds that will result in the construction of approximately 100 MW of DBCI. Funds for small installations are allocated to installations using biogas other than agricultural, hence for installations using biogas extracted from a landfill site (405 PLN) and biogas extracted from a sewage treatment plant (365 PLN). In the scope of new installations, it is planned to construct approximately 5 MW of capacity for each type of these installations. In this basket only one auction for large, new installations will be organized. Funds from this basket are intended to provide support for waste incineration plants that produce energy (385 PLN). It is planned that results from the auction support will be given to installations with total capacity of 150 MW. According to publicly available information, there are five waste incineration plants in Poland which produce nearly 334,000 MWh/year. (This data is an unconfirmed estimation due to the lack of official information in this respect.) Assuming that the winning installation will produce the same amount of MWh every year (which gives production of 309,600 MWh annually), contracting the total volume in this basket will result in an increase in the energy generation of those installations of 92 percent. In this basket three auctions will be organized, all addressed to hydro-electric installations (480 PLN) able to achieve at least 3504 MWh/MW/year. Hydro-electric installations below this threshold will need to participate in auctions in the basket of other installations. In addition, large offshore wind energy installations (470 PLN) may potentially take part in auctions in this basket—if such installations will be able to produce more than 3504 MWh/MW/year. Similarly, as in the case of the basket of high-efficiency installations, this basket may be joined by investors planning to install on-shore wind turbines (350 PLN) of a new generation, only if the information on sufficiently efficient technical setups is confirmed. In the scope of existing installations, it is intended that as a result of the auctions from 2017 and 2016 approximately 80 percent of existing, small hydro plants will be transferred to the auction system. The budget for new installations will enable the construction of 10 MW of small installations and 10 MW of large installations (this indicates that offshore wind plants can take part in the auction only hypothetically). In this basket four auctions will be organized, each solely for agriculture biogas installations (PLN 550). The government in its rationale of regulations did not indicate the percent of existing installations that will be transferred to the auction system in this basket. In the scope of auctions dedicated to new installations, it is planned to allocate support to small installations with total aggregated capacity of 70 MW and to large installations with total aggregated capacity of 30 MW. In this basket two auctions for new installations are provided. The last auction in this basket, in December 2016, was the only auction where the bids outstripped available volume (from 152 bids only 84 were chosen). Keen interest is also expected this year, although funds allocated to the auction are nearly three times larger. It is planned that support will be obtained by installations with total capacity of approximately 300 MW in this auction. If solar plants obtain the said support, it will mark a significant increase in the capacity of these installations. The installed capacity of solar energy installations in Poland and the contemplated impact of the auction in 2017 on this capacity is presented in Figure no 3. Source: Data disclosed by President of the ERO. The data concerning the capacity from the auction presents only the estimation of the Ministry of Energy. In 2016 it was intended to support approx. 100 MW of new power, but only 84 offers were chosen in the auction. The aggregated capacity of these offers is unknown, but as the auction was addressed to small installations their aggregated capacity may not exceed 84 MW. Keen competition is expected in this basket, which is dominated by onshore wind energy installations. There are two main reasons for this. First, the planned budget provides support for approx. 150 MW, which might be significantly lower capacity than available for existing projects that can submit bids in this auction. In practice, if bids are submitted in the auction for the new installations with higher effectiveness than the level used for the calculation by the government, the volume of offered electricity from these installations will be proportionally higher. In this case, support will be allocated to installations within limits closer to 100 MW of new generation capacity. Second, the negative approach of the current government to wind farms is not a secret. Therefore it is conceivable that the auction in 2017 will be the last one in a few years with funds allocated to this basket. Moreover, the entry into force of the Act of 20 May 2016 on investments concerning wind turbines stipulates that a building permit for wind turbines issued on the basis of zoning decisions will expire if the occupancy permit is not obtained for the wind turbine by 1 July 2019. Based on our own knowledge, quite a large number of wind turbines were developed on the basis of zoning decisions (not on the basis of local zoning plans, as required by the abovementioned Act). Therefore, in light of the time required to build wind turbines, this auction may be the last chance some wind farms have of obtaining the state aid they need to ensure financial profitability of the project, in light of the occupancy permit issue. Building permits for many projects face expiry, and it may prove impossible to obtain new building permits under the new Act. There are installations with capacity of up to 1 MW (small installations) and those with capacity of more than 1 MW (large installations). From 1 January 2018, only RES installations with a capacity less than 500 kW and agricultural biogas installations will be able to benefit from mandatory purchase of electricity. Taking into account that currently known connection conditions for off-shore installations book capacity around the 1000 MW threshold, exceeding many times the assumed budget of auctions, we treat participation of investors based on this technology as purely hypothetical.